Humble RPG Book Bundle Offers Nearly 40 Items for $15 | Nerd Much? Humble has announced a new bundle headed our way. The Humble RPG Book Bundle has been announced featuring a slew of great RPG books. And as always, purchase of the bundle sends proceeds towards a great cause. 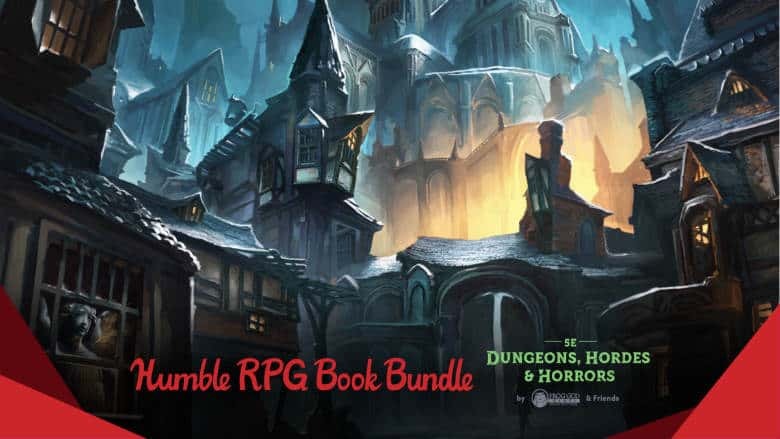 The various RPG books included in the Humble RPG Book Bundle includes 5E Dungeons and Hordes & Horrors by Frog God & Friends. There are a ton of books included in the complete set. And to get them all Humble is asking that you splurge a mere $15. If you would prefer to just did your toe into the Humble RPG Book Bundle, $1 still gets you a ton. Books included are Prepared! A Dozen Adventures for 5th Edition, The Rising Knight, Assault on Blacktooth Ridge, Slag Heap, Wicked Cauldron, Quests of Doom 4: Awakenings, Quests of Doom 4: Cave of Iron, The Braingorgers Appetite, and The Lost Lands World Map. A 30% off coupon towards books by Frog God Games, Kobold Press, and Troll Lord Games is even thrown in too. If you would like to upgrade your book selection to the $8 Humble RPG Book Bundle tier, you go everything above plus 12 more tomes. They include Usurpers of the Fell Axe, The Shattered Horn, Of Banishment & Blight, Beneath the Despairing Stone, Forsaken Mountain, Quests of Doom 4: The Desperation of Ivy, Quests of Doom 4: Pictures at an Exhibition, Quests of Doom 4: Fishers of Men, Quests of Doom 4: Forgive and Regret, Into the Deep Dark, Quests of Doom 4: A Little Knowledge, and Prepared 2: A Dozen One-Shot Adventures for 5th Edition. Finally, the elite package of the group is the $15 grouping of the Humble RPG Book Bundle. With it, you get the 21 books mentioned above as well as the following titles on top of those. Beneath the Helm of Night, The Last Respite, The Wasting Way, The Paladin’s Lament, The Blight, The Tome of Blighted Horrors, The Crooked Nail, The Horror in the Sinks, The Bloody Jack, The Crucible, The Children of the Harvest, Tome of Adventure Design, The Blight Game Master’s Guide, The Blight Player’s Handbook, The Blight Poster Maps, Items Wondrous Strange, Blood Vaults of Sister Alkava and Grimalkin. To get a closer look at all of the books thrown in with the Humble RPG Bundle you can head to their site via this link here. All purchases will send a portion of funds to the Navy-Marine Corps Relief Society, so you can mark off your good deed for the day when making a purchase.